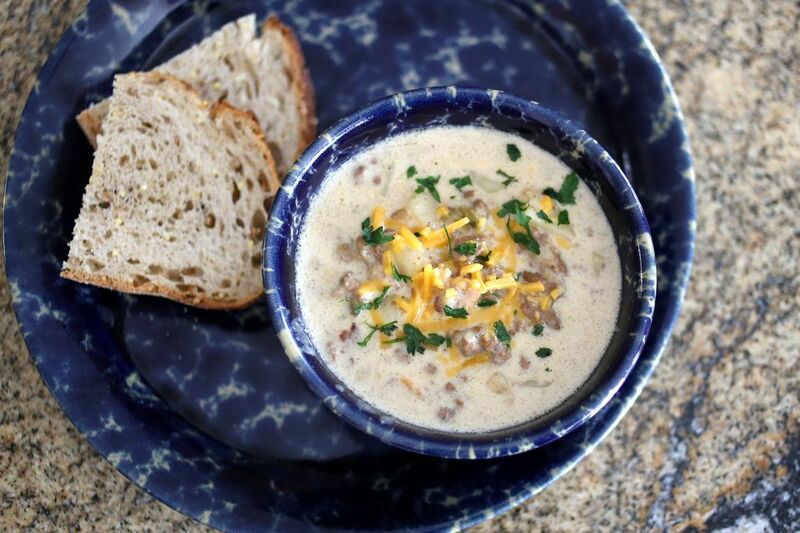 This cheeseburger chowder is a delicious blend of ground beef, chopped vegetables, and cheese. Some beef broth enhances the beef flavor while the milk and cheese make it creamy. You can cook this chowder on the stovetop or the slow cooker. Make it with part cream along with the milk for a richer chowder, and feel free to tailor it to suit your taste. Add some bacon to the ground beef mixture for a bacon cheeseburger chowder. See the tips and variations for more. This is an excellent soup to make for a party or tailgating event. Put it in the slow cooker and keep it on the warm or low setting for serving. In a 4-quart Dutch oven or saucepan over medium heat, cook the ground beef with the celery and onion, stirring, until the beef is no longer pink. Drain off excess fat. Stir in cubed potatoes, chopped green pepper, beef bouillon, and the condensed beef broth. Cover the pan and bring to a boil; reduce heat and simmer until the vegetables are tender, about 20 to 30 minutes. Add the milk to the pot and whisk the flour with 3 tablespoons of water until it is smooth. Add the flour mixture to the saucepan. Cook and stir until thick and bubbly. Add the shredded cheddar cheese; heat and stir until the cheese has melted. Ladle the soup into bowls and garnish with some shredded cheese and chopped parsley, if desired. Brown the ground beef with the celery and onion as above. Drain off fat, stir in the potatoes, bell pepper, and broth. Bring the mixture to a simmer and then transfer to the slow cooker. Cover and cook on low for about 5 to 6 hours, or until the potatoes are tender. Or, cook on high for about 3 hours. Add the milk to the slow cooker and then stir in the flour and water mixture (see above). Add the shredded cheese. Set the slow cooker on high and cook for about 30 minutes longer, or until hot and thickened. Garnish with more cheese and parsley, as desired. *If you don't have condensed beef broth, use 1 1/2 cups of water combined with 1 tablespoon of beef base or bouillon granules.